Home Technology Telecom Are You Getting the Most from Your VoIP Office Phone System? Are You Getting the Most from Your VoIP Office Phone System? Imagine having an expensive, high-tech smart phone and only using it to make calls, letting texting, email, internet connection, etc. That would be a huge waste of resources, right? Well, having a VoIP office phone system and only using it to make office-to-office calls is remarkably similar. You’re paying for functionality you’re not using, and you may not even know it’s there. Ask yourself these questions to make sure you’re getting the most from your VoIP system. 1. Do You Have the Right Phones? All phones are not created equal, and the phone that’s right for one employee may not be right for another. One important factor to consider is how many lines you need (and that might be different for everybody in the company). Employees who get few calls don’t need four or five lines, because they’ll never be used. Call center employees, on the other hand, have to be able to juggle multiple lines at once. Getting the right phone to the right employee can substantially increase productivity and help you see a good return on your investment. 2. Do You Have Enough Bandwidth? 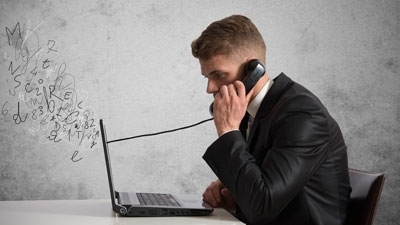 Your VoIP office phone system is only as good as your internet connection. Voice is transmitted as data packets, and it’s somewhat bulky in comparison to other types of data. If employees are complaining about the call quality, or even circumventing the system by using their personal cell phones, consider increasing your bandwidth. With enough bandwidth, call quality should be excellent. 3. Are There Features You Aren’t Using? If you’ve had your office phone for a while, there may be some great features you’re not using or may not know about. Maybe you never had time to learn about all the bells and whistles in the first place. Or maybe there were some you didn’t need at the time and have now forgotten all about. For instance, are you still depending on a management “phone tree” to get critical messages out to all of your employees? Your VoIP system can do that for you. Do you still have to call around between office, cell, and home phones to track down the people you need to talk to? Your VoIP system can make that seamless. When you’re waiting on somebody to get back to his or her office, do you have to keep walking by to check? Your VoIP system can let you know when they’re back at their desk. If you’ve ever thought, “I really wish our phones could do X,” take the time to look into it. Maybe they can. 4. Are You Paying for Your System in the Most Cost-Effective Way? VoIP office phone systems can be either purchased or leased. Leasing has a number of benefits, including the ability to upgrade your system to keep up with the latest technology. Leasing also provides tax benefits, because you can deduct your monthly payments as an operating expense. In some cases, you may even be able to structure your payments to work with your business’s cash flow and business cycles. Whether you lease or purchase, your VoIP office phone system is an investment. As with any other investment in your business, you want to know you’re getting the best possible return, right? You can accomplish that by making sure that the right phones go to the right employees, you have the bandwidth to accommodate your call volume, you’re making full use of all the features, and you’re paying for your system in the most cost-effective way. If any of those areas are weak, you can boost your return on your investment by tweaking where needed. When fully implemented in the right way, your phone system can turn out to be one of the best investments you’ll ever make in your business.